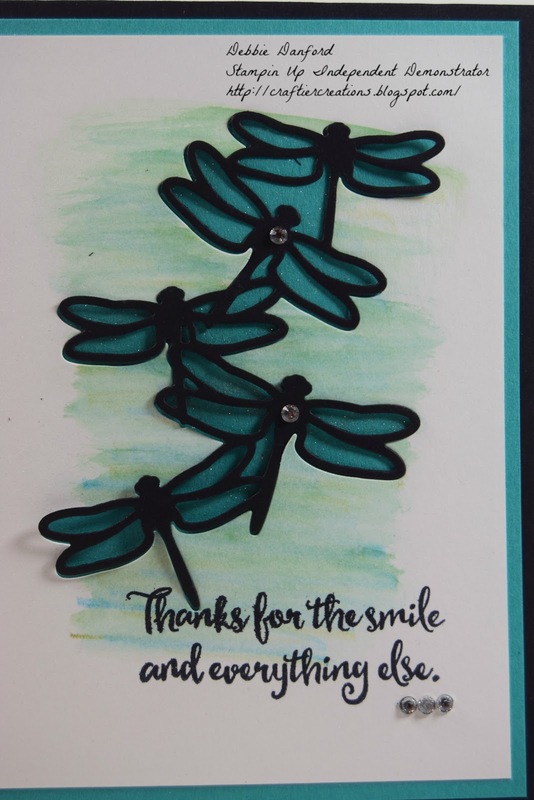 I wanted to show you one of the cards that we made at the Spring Extravaganza, & what I did with an extra background piece. Robin (another SU Demonstrator) & I were lucky we got a very easy card this time! Die cut the solid dragonfly out of Whisper White & the detailed dragonfly out of Basic Black. 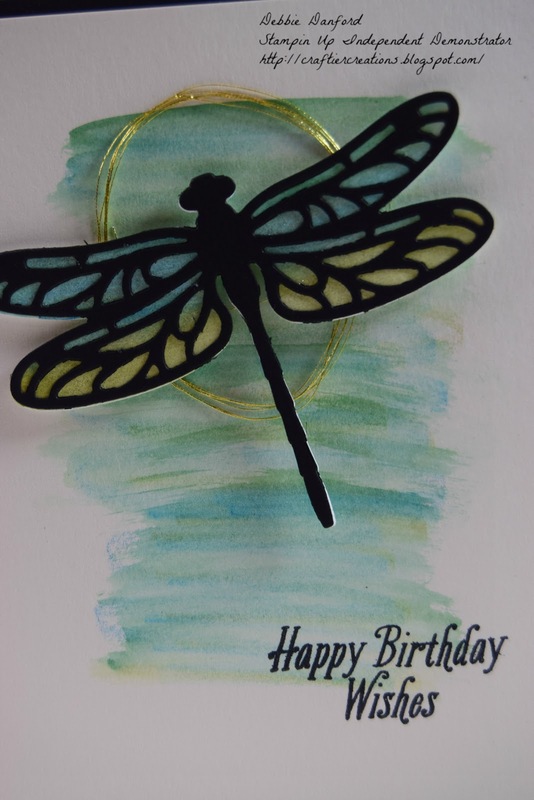 If you are a paper saver like me I would die cut the dragonfly out of the Basic Black layer. No one is going to see under there. On Shimmer paper color (or scribble) with Water Color Pencils. I used Old Olive, Bermuda Bay & Pacific Point. Then go over the top of that with the Aqua Painter very lightly. Just enough to blend the Water Color Pencils in. Repeat this same step on the Whisper White dragonfly. On top of the dragonfly add clear Wink of Stella. 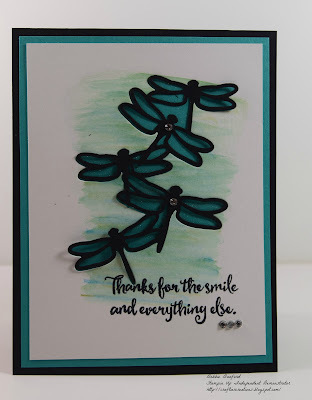 Attach detailed dragonfly to Whisper White dragon fly with Tombo glue or 2-way glue. What ever your favorite is. I used dimensionals to pop up the dragon fly, don't forget to add the metallic thread. After making all our samples, I ended up with one extra piece of Shimmer White already colored & stamped. 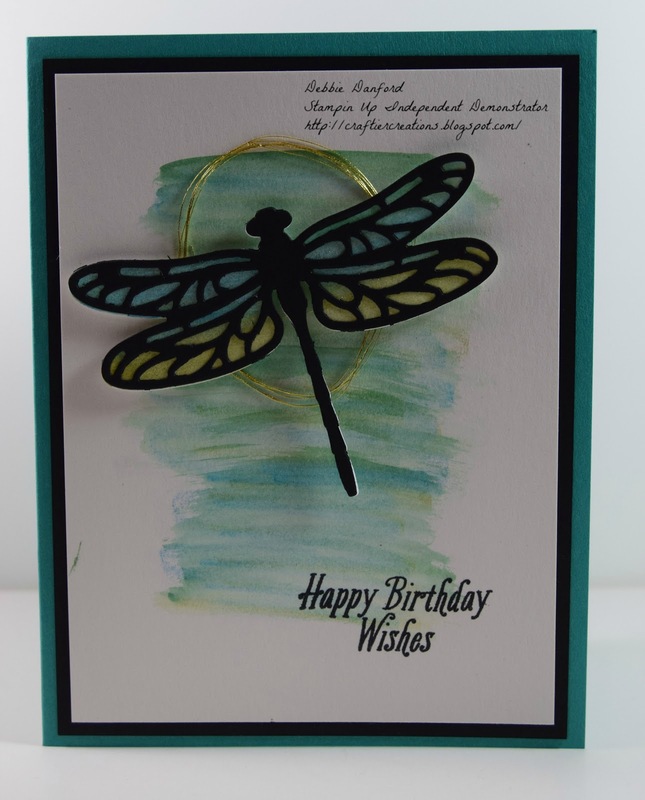 So...out of the Basic Black layer & the Shimmer White I die cut the 5 dragonflies. I then took the Basic Black one & attached it in the negative space on the Shimmer White. My next post I will show you what I did with the Shimmer White Dragonflies. What do you think 2 different cards with the same background.